Three rules in total. Three rules that, once the theme was announced, helped me establish a clear goal. For example, the small resolution and tile-based approach helped me establish the art style, level and user interface design. Working on a 256×384 screen I could only fit 8 / 12 tiles (32×32) on the screen, or 16/24 tiles at 16×16 pixels each. The AI requirement weighted in favor of the strategy genre and, it’s subclass, the god game genre. From here on, I went with the entire map being confined to a single screen (in order to have a good view of your population, and not have to hunt for them everywhere). This also affected my User Interface Design and Experience, since It had to take as little screen space as possible. Little screen space for UI implied having only a handful of buttons during game play which, combined with the god-game thematic, had me limit what tasks the player could focus on. A small amount of tasks for the player to perform required me to streamline the entire “god game” approach and make it as minimalistic as possible (the soul experience as I like to refer to it). You can see how things developed further on. Using a WIKI to plan ahead. Features, classes, how the AI should perform, etc [click here for a screenshot of the wiki]. Not stretching further than I can and imposing strict limits. Making fake-screenshots(mockups) before beginning development so I can plan my interaction approach. Using tools and frameworks that I was familiar with. Selecting a limited color palette to work with. The UI only interaction means that I can also port the game to tablets. Using “procedural” generation to save time (from level design) and focus on other areas. Nailed the risk-reward motif due to Wolves acting as a source of food but also damage to the units. My innate lack of knowledge when it comes to composing and/or generating appropriate sound effects. Having to remove the “convergence” scene. After winning a level, the player was supposed to reach a new world with his highest level followers and watch them fight off the inhabitants. I regret removing because it would have had a better tie in with this jam’s theme. Further more, I had a system which allowed the player to revisit worlds that have been previously populated, to see how they are doing. The game’s balance is a bit off. Level progression of your followers vs level progression of the wolves is tipped in favor of your followers for the first few levels. A few wolf summons in and you can only take them on if you have a high level character that survived. Social interactions are only represented by heart animations on individuals, but it’s hard to tell who “copulated” with whom. More so, a death of a birth of an individual is represented by their respective sprite disappearing from the game. Health, hunger and level indicators are way to small and crammed into a unit’s sprite. The tutorial is just a image and does not convey all the information needed. I feel that with each Ludumdare event I partake in I can quantify my progress as a Designer. My first entry required the player to quit the game in order to restart the level and featured only mechanics but no clear goal (also no Ui of any kind). In my last LD (7DRTS) attempt I finally had a entry with no missing UI options and a clear navigation path. You can see where I’m going with this. But all in all, I’m glad that with each submission I end up acquiring new knowledge. As far as limitations go I believe that it’s better to know what you should not do as opposed to not knowing what to do. Hopefully my next LD submission will blow this one out of the water. You can play and rate the game here. Linux, Mac and, hopefully, Android coming tonight. I’ve also uploaded it to itch.io and, in the weekend, will release a post-compo version that has sound and the features that were cut off. Fantasy Warrior Manager is a 2D tile-based game, designed around the limitations of a NDS screen, in which the player assumes the role of a Tribe Leader. He must train and provide food for his warriors, in order to make them stronger. Every week a cosmic event takes place and merges the worlds of the game into one, and a battle between tribes take place. The goal of the game is to get your population to survive for one month (in-game time). I’m in for this edition of Ludumdare for the 4th time. As for a closing statement, I’m going to take part in this challenge from Mobility-Games’s office. Hopefully I can do something really neat so that I can get my co-workers into jamming with me next time. Probably not going to be able to stream, but I will tweet the hell out of my entry (@zapakitul). Newcomers: All you have to do is FINISH something. It doesn’t have to be unique, it doesn’t have to be outstanding or win any awards. It just needs to be finished. Everyone else: Give me good games to play and rate! I’m in for this October Challenge. The game I’m currently working on is Mutant Gangland, a Turn Based Strategy game set in a floating wasteland in which Mutants and Exo Mutants fight for control of the island. I keep a devlog on Devsofa and I will most likely share allot of stuff in the upcoming days. When I first started MIW the goal was simple: A 2D war fighting game in which the player placed his troops, issued orders and sat back to follow the outcome. I guess I can say I succeeded as my entry featured all the above. The down falls? No sound, over powered player units and little-to-no-polish. That’s why I decided to release a second, post-jam, version with a simple Main Menu, more maps and balanced gameplay. The game still has no sound effects and music because, well… um, I have little-to-no talent in that area and I wanted to keep things in the spirit of Ludumdare where all the assets are created by me. Maybe in another version, when things settle down (I still have to release another Pimps vs Vampires version this week, and I also have some freelancing work to attend). The first thing a player must do, when the game starts, is to deploy his units. He has 1300 points which he can exchange for Soldiers and Tanks. Both unit types can be placed on the lower part of the screen (2 rows). After deploying all of his units the player can assign orders to each one (move to position X and defend or move to position and engage/attack). He can also skip this phase and start the simulation (in the post-ludumdare version orders can also be issued by pausing the game mid-play). Player and enemy units clash somewhere in the middle of the map. The game can be won by either defeating all the enemy units or by successfully sending 3 units on the opponent’s starting rows. I decided to stick with LUA for this Jam but I changed just about all the tools that I used in previous jams. The framework I used was MOAI SDK (for which I wrote a basic wrapper) and my IDE was Sublime 2. Coding started out well but halfway through I started hacking things together, which as always, turned everything into a mess. I have more nested if statements in game.lua then your average pop singer amount of twitter followers. P.s. I’m Open Sourcing the code under CC-3.0 for non-commercial use. The assets are available under CC-3.0 SA and the .pdn (Paint dotNet) file can be downloaded from OpenGameArt. Feel free to fork the project on github and alter it. Going to try and work on MIW during my spare time, to add new units, fix bugs and improve code readability. Less then 12 hours left and a lot is left to do. The gameplay mechanics are in and working as they should (most of them). Gonna spend the following 5-6 hours playing around with FamiTracker. At the start of the game the player has a certain number of points (still tuning the number) which he can exchange for troops: Soldiers and Tanks (maybe two more if I have the time). Soldiers have a smaller range and health than tanks but their fire rate is bigger. After units are deploy the player may set a path for them to follow (send them towards certain positions so they can flank the enemy, have them move between two points, etc). Once the game starts, the AI takes over and the player will watch if his strategy pays off. The invading units (Red guys) have the same stats as the player units. They advance towards the lower part of the screen and change position on the X axis, sometimes backtracking to avoid the player. 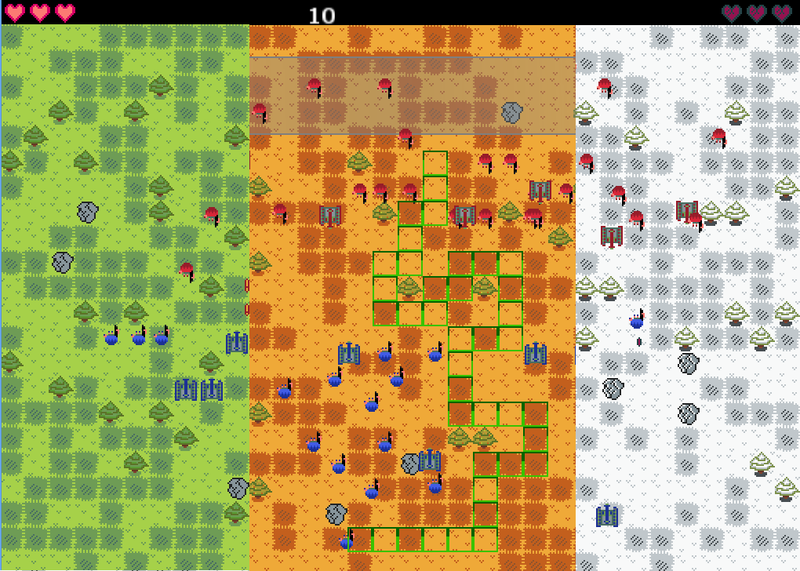 Once the enemy units pass the middle of the gamefield their attack increases by 2 for each tile from the first row. So camping on the last layer isn’t quite a good option. Their position and unit types are randomized in the beginning. Setting a soldier’s wacky path with the “defend” option selected. Now it’s time to experiment with Fami Tracker and add sounds and (hopefully) a soundtrack. If times allows me I will try to “juice” the game a bit with some animations and maybe a few more units. But, this is what you should expect in the final version. P.s. Will package the game to run on Windows and Android (MOAI). After the deadline, I’ll build MOAI for Linux and Mac and get it working on those platforms. Soo, what do you guys think? That’s about it for now. I’m actually curious to where I can take this game. Because I’m about to Jam. And just like any printer, I have prepared my ink cartridges ( props go to @ThomasNoppers for the color palette), got a fresh new batch of dark, sublimely beautiful, paper, a brand new USBase-code and my driver is powered by MOAI SDK. Most of my ink will be consumed by drawings made in Paint.NET. So yeah, cheers to a new Ludumdare and to all you guys. Went to bed last night after the theme was announced. I was hoping for “end of the world” and already had an idea in mind that I could hack right away. Once I noticed that “You are the villain” has won I decided to take a nap and try and approach the theme later. Well, taking the nap was a great idea, as I woke up with a plan. The basic idea? The player controls a group of cute-yet-deadly monsters. Each of them are in different parts of the world. The goal? Get them all safe to the rendezvous point and open the gates of hell. Each monster has his own path towards the end goal. For example, SMUC-Bunny (above mockup) was picking up skulls in the lushes garden when he got called. He must fight his way through Cops, Militia and Swat Teams (and maybe kill a few squirrels on the way). As far as mechanics, the player must slash through the enemies and dodge their projectiles. WASD for movement and Space to attack. There will be a maximum of 6?-7? enemies on screen. By killing enemies the character get’s a speed boost (nitro-blood? :D) allowing him to reach the goal much, much faster. Gonna spend a few more hours polishing the design aspects of the game. A voice whispers to me. And with a bit of luck, I will strike gold. Hope the poem turned out alright. Anyway, I’m in for my 3rd Ludumdare. Probably going to use Lua + love2D + LDT (lua development tools), Paint.NET for graphics and Audacity to record sounds. Best of luck to all. So, here’s my progress report for the game, as it is right now! Decided to call it Genetics-Pop, because you spend most of the time making a row of 3 cells of the same type, in order to mutate the organism! Each successful mutation awards the player a few extra seconds and points, which can be spent on bombs (bombs mutate a 3×3 square). Each level requires a certain number of cells to be “mutated” in order to be completed! After each level, the organism, at the bottom of the screen “acquires” a new limb/feature. The game is lost when the timer reaches 0, or when there are too many (not sure how many now) active cells on the screen. Quit my job, moved into my parrents basement (till I find a new suitable apartment), looking forward to go indie, full time. This being said, I have no excuse to not be in this round. Missed LD23 due to the crunch time brought by the need to release NOVA3, and I felt bad! With any bit of luck I can use the LD24 game as my first, crappy-ish :D, debut game. Good luck everyone, and may thy pixels and voxels, vertexes and computer specs turn out to be just as awesome as you want them to be! P.s. had no idea how to name the post, so I went with “that”! Edit: Forgot to mention: Not sure about livestreaming, but drop me a line @zapakitul on Twitter or G+ , if you are up for a Hangout! I’m a little saddened that I cannot join the main compo for the 23rd edition LD, hence the deadline for the current project at work is on the 20th. I’ll try to join the jam and see if I can find enough strength left in me to finish something for it. In order to ease things up, I’m looking to join up with someone who wants to enter the jam and needs a coder. This is my second participation in LD, the first one being LD22. I really loved the last compo, and I know I’d never forget myself if I miss this one (the prototype I made for the LD22 was used as a starting base for a much bigger, personal, project). I’m a decent C++ coder and thanks to AGK (library) I can get a 2D game up and running for iOS, Android and PC in a couple of hours. So if anyone is looking to join the jam, drop me a message on twitter (@zapakitul), or leave a comment here. 29 queries executed in 0.129 seconds.